So, school’s out and you’ve got this time freed up. Maybe you’re not quite old enough for a job yet. Maybe you’re lazy and didn’t look for one. Maybe your parents didn’t push for you to get employed for the summer. They want you to have a good time, and you plan on having one. Friends are cool, but friends are busy too. They’ve got their camps, their family vacations to foreign places, their “other” friends. You’ve also got your own things, but you can only play sports for so long. There’s only so many chores to do. A significant amount of this summer is going to be spent in isolation. Hm. What do I do with that? Having no job—for whatever reason—you have to rely on your allowance and forms of unexpected income (birthdays, odd jobs, etc.) 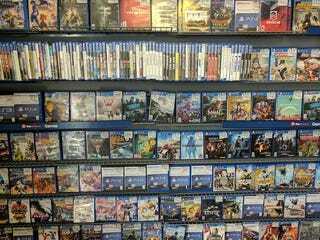 to purchase some games here and there. Being an experienced gamer, you know what it’s like to get burned by a bad one. You do not want to live with that buyer’s remorse this summer, not with such limited funds. Simply visiting a game’s website is not going to cut it. There’s research to be done. What’s the score on various game ranking sites? What are people specifically saying in the reviews? What have your friends said about it? More importantly, what kind of game do you want? The upcoming week is looking really dead, like the-only-kind-of-human-contact-I-might-have-on-Wednesday-is-my-parents sort of dead. I will die of boredom if I’m stuck at home watching midday reruns. This game can’t just be good. It needs to be great. It needs to be overflowing with content. It needs to have a memorable story. It needs to have freedom. This summer you are free, and your game needs epitomize this. You’ve narrowed it down to a few choices. One comes from a developer you trust; this a reliable game. Another has a style of gameplay that you’ve never experienced before; this game entices you. There’s a game with a quality you just can’t explain and it’s drawing you in; this is a game you want to gamble on. But there’s only so much money. These games are newer and their prices haven’t been reduced yet. Do I have alternatives? Although you’re young, you’ve got some good years of gaming under your belt. You’ve just been moving on from one game to the next, and you’ve been developing. You’ve been growing up. Maybe it’s time to go back and give some of those “classics” another shot. Let’s test out that nostalgia thing everyone’s been talking about. This is cheap; you do not have to put up any cash for this. You remember that your older brother is working for the summer near the college he attends. He left his old systems behind. He said he doesn’t have time for them right now. There’s this whole generation of gaming that has preceded you, right there in his room. Would he care if I went in and played around? Why did people ever hold these cartridges in high regard? Where did all the games I play come from? What is the foundation to modern gaming? How far back do these origins go? So far this summer has been more about questions than answers. People who haven’t seen you for a while ask you how you’re doing. “What have you been up to?” They are not gamers, so you smile and say, “Not much. Been up to my own thing.” You do this because there is no simple way to sum up all the hours you’ve put in, all the setbacks, the Game Over’s, the fetch quests, that one dungeon you weren’t even looking for. Not unless they’re gamers do they understand the persistence you’ve been exercising. You’ve been bumming rides to GameStop, perusing the walls, digging in the discount bin. You’ve been expanding your browser history, checking the sales on Steam, apprehensively asking your Dad if you can borrow his credit card so you can download a new game. You’ve been exchanging games with your friends who do not return your games in a timely manner, and you’re learning about the trade. These people who ask what you’ve been up to, they do not understand the secret life. It’s over one day. School sneaks up and it’s suddenly time to wake up before 11 AM. You don’t know how many days in a row it’s been that you’ve stayed up until 3 or 4 in the morning, so this is going to be an adjustment. You’re proud that you found material to fill your nights with. Those nights were alone but they were a little less lonely. And this has all been important, but you don’t realize this yet. You don’t realize that you’ve been exploring your priorities. You don’t realize that you’ve been practicing at your finances. You don’t realize that you’ve been optimizing your time. You don’t realize how good a time you’ve been having, how fondly you will look back on this, how you will not have this summer when you’re older. You are simply grateful, and you’re already looking forward to another night alone in your room, lit only by the TV screen, playing your latest conscientious purchase.